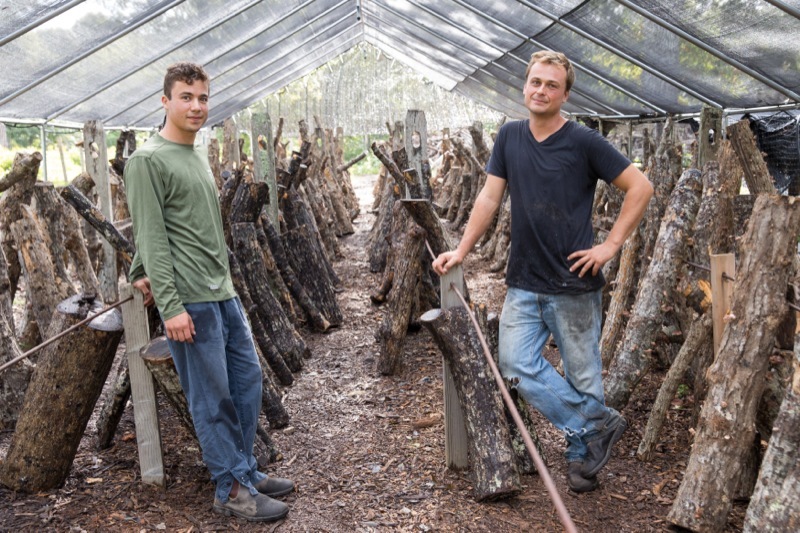 Down a long, bumpy, Chilmark road Truman French and Tucker Pforzheimer are at work on a small-scale, massively ambitious venture to cultivate, harvest, sell and promote one of the world’s healthiest foods. Their two-man mushroom operation requires very little water and nary a pinch of fertilizer nor a drop of pesticide. “Shiitakes are a protein source that feed on waste,” Tucker explained, as though he could hardly believe it himself. “It’s going to be the new ‘it’ ingredient.” For Truman, sourcing protein has always been a concern. He was raised vegetarian and has never eaten eggs, meat or fish. To hear the two young men, both now 26, tell it, shiitakes could be the world’s most perfect food. And it’s true: mushrooms boast a long list of immune-supporting health benefits, and are rendered delicious with just a little butter and a quick sauté. As undergraduate classmates at Harvard University, Truman and Tucker were living parallel lives, which didn’t intersect until they met in a Biology of Fungi class in the spring of 2013. They had both recently returned from studying abroad in South America, and maybe because of the obvious inevitability, they were a little reluctant to meet at first. But once the friendship was established, the business plan for MV Mycological was not far behind. After graduating, Truman moved home to the Island and began inoculating oak logs with shiitake fungi from the University of Wisconsin. He worked closely with family friend Heidi Feldman, of Martha’s Vineyard Sea Salt and Down Island Farm, who offered invaluable tips as well as some old equipment. Meanwhile, Tucker still had a year of school, and visited the Island when he could. Growing up in the restaurant industry, he is at ease chatting with chefs about products, “We’re a great marriage of skill sets,” he said. In April 2015, Tucker moved to the Island full time. After much nail-biting and contingency planning, the inoculated logs began producing meaty shiitakes with perfect caps that May. In just over a year, Truman and Tucker have expanded the farm, securing a spot at the West Tisbury Farmer’s Market and landing MV Mycological mushrooms on menus at some of the Island’s top restaurants, including Détente, Sweet Life Café, and l’etoile. Recently Tucker has set his sights on Boston, where he sells to an increasing number of the city’s chefs. Truman and Tucker keep tabs on where their mushrooms go and how they’re being prepared, “I like to talk to every chef,” said Tucker. And while visibility is great for business, expansion for expansion’s sake goes against their sustainable, forward-thinking ethos. “Rather than expanding we need to use what we have more efficiently,” said Truman. By the looks of it, they’re succeeding. Make a Tapenade: Blend 1/2 stick butter and 1 qt mushrooms in Cuisinart for 2 mins. Make a Roux: Simmer onions, 1/2 stick butter, flour and tapenade in pot for 10 mins. When thick, add water, potatoes, 1 qt mushrooms for 20 mins, stirring frequently. Finish with half and half, salt, pepper and warm on low heat for 10 mins before serving.